What is the purpose of God’s moral law for those who believe that “Christ is the end of the law so that there may be righteousness for everyone who believes” (Romans 10:4)? For these discussions, “law” refers to God’s moral law, which finds its expression in the Ten Commandments (see Exodus 20:1-17). Rooted in the very character of God and given to us directly by him, it is timeless and irrevocable, and binding upon everyone everywhere. You can fight about where to put these later. First, be sure you know what they say! Christian thinking often refers to the various “uses” of the law. The “first use” is to expose our sin and drive us to the Savior (see my “Law 101” post). The “second use”, put as simply as possible, is this: God’s moral law exists as a means to restrain sin in society and provide a template for human interaction. In our current setting (21st century America), we all know the debates that this idea creates. 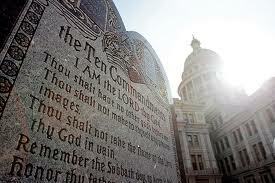 There are countless examples of court cases about whether the Ten Commandments should be displayed publicly or not. There is also intense public debate about whether it is appropriate (or even possible) to legislate morality. As important as these debates may be, they often degenerate into excuses for political posturing or ideological invective. Is this the second use of the law? Providing a platform for public debate is not the purpose of the second use of the law. Nor is the idea behind the second use of the law one of mere public policy. It sets the boundaries for actions at every level. Whether at the level of national government or individual behavior, the moral law of God reveals to us sound standards upon which to base our actions by showing us what is good and pleasing to God and, conversely, what is displeasing to him. This is why the Westminster Confession of Faith speaks of the moral law like this: “Although true believers be not under the law as a covenant of works, to be thereby justified or condemned; yet it is of great use to them, as well as to others; in that, as a rule of life, informing them of the will of God and their duty, it directs and binds them to walk accordingly…” (Chapter XXI). Not only do the Ten Commandments inform us of the will of God, our duty to him and to others, but they also make for good society. In other words, both believers and unbelievers should be able to agree that it makes for harmonious living if these laws are followed. 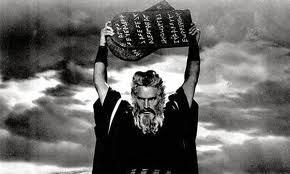 While unbelievers will find it harder to see the relevancy of the command to worship God alone and honor the Sabbath (along with the rest of commandments 1-4), everyone should be able to agree that keeping the 5th-10th commandments will make for good community and decent society. It’s hard to make the case that dysfunctional families, murder, adultery, theft, lying, and jealousy are good things in which to engage. In short, if you were looking for behavioral prescriptions that would make for a safe and healthy society, look no further. If you are looking to find out how you should behave toward your neighbors–and what behaviors to expect from your neighbor–look no further. If you are looking for boundaries and markers to show what kinds of sins must be restrained and policed and even punished, look no further. This isn’t to say that a society needs no other rules than these. We do. We need rules that have to do with tax and trade and a million other things. But we do not need less than this. The “second use” of the law is to reveal God’s will regarding the kinds of things that cannot be allowed to run rampant without destroying the fabric of a society. They are wise and relevant words. They are divine words.They are worth listening to.